The reasons publishers make changes in wood blocks in the middle of, or between, edition runs are multifarious and every last one of them is fascinating to the truly dedicated collector of ukiyo-e. In kabuki prints, for example, we sometimes encounter works nearly identical except for the name of the actor emblazoned on the sheet. On closer inspection we notice that the face of the performer, too, is slightly altered. What happened here was a two-step surgical operation in the print workshop. The original name was chiseled away from the key block as a new one got carved in relief on a separate block. And then, more delicately, the chunk of block underlying the old face was excavated and a new plug of wood, sporting different eyes and nose, found its way into the hole (see the article on ireki). The result of the operation — necessitated by an actor's demise or a new production — is seamless enough to impress a Hollywood S/F technician. Likewise, geisha and sumô wrestlers tend to look the same from the neck down, so similar cut and paste procedures could be performed on those types of blocks, too, when individual careers faded in such youth-driven professions. But what about landscape prints? What could cause a publisher to tinker with the details of compositions in that genre? While aesthetic considerations are assumed to have motivated changes in some prints by Hiroshige, something quite different seems to be at work in the landscape by Sadanobu I (1809-69) illustrated here. In the early c. 1867 impression (Fig. 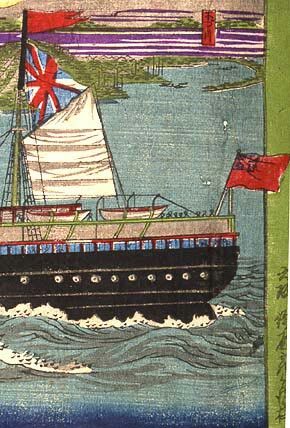 1) of this image from a never-completed "100 Views of Osaka" series, the sidepaddle steamship flies a Japanese flag midship and a US flag astern, as befits a boat introduced to shogunal waters by Admiral Perry. In the second edition, however, from sometime the following decade (Fig. 2), garish aniline dyes have made their appearance, of course, as well as trendy Western-style shadowing on the sails. But also altered are the designs on the flags. All suggestion of a Japan-US connection has been replaced by three variations on the theme of the Union Jack! Granted that the color blocks had to be recarved for this edition, what could have inspired the publisher, in an otherwise drastically cheapened effort, to jettison Old Glory and the Rising Sun? A shift in political winds? 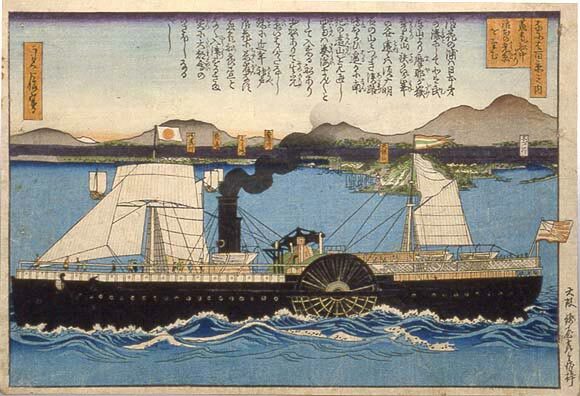 The arrival in Osaka that week of an English vessel full of potential customers? Most certainly we will never know, but that doesn't stop the agreeable musing. This article originally appeared in Daruma, no. 28, Autumn 2000. Copyrighted © text and pictures reprinted with permission.